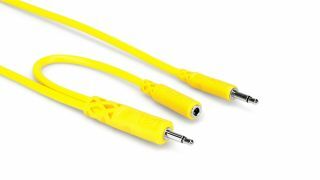 The What: Hosa Technology is now shipping its CMM-500Y Series Hopscotch Patch Cables. Designed with modular synthesizers in mind, the new CMM-500Y Series features a unique pigtail patch point that enables users to split a signal at its output for additional versatility. The What Else: Using patch cables, audio signals can “jump” from one device to another. This is most noticeable in modular synthesizers, where signals travel in and out of modules multiple times. Hosa’s Hopscotch Patch Cables each include a short pigtail with a female 3.5mm TS jack at one end of the cable. This jack makes it possible to take a signal that has already been patched elsewhere and send it along a completely new path. The pigtail design moves the jack far enough away from the connector—where space is limited—but close enough to identify the output to which it is connected. Hopscotch Patch Cables are color-coded by length to easily identify the cable needed prior to making the next patch. CMM-545Y consists of five yellow, 1.5-foot (45cm) cables. For an assortment of lengths, the CMM-500Y-MIX includes one of each of the following cables: red 6-inch (15cm), orange 1-foot (30cm), yellow 1.5-foot (45cm), green 2-foot (60cm), and blue 3-foot (90cm). The Bottom Line: Featuring Oxygen-Free Copper (OFC) conductors, flexible spiral shielding, and nickel-plated plugs, Hopscotch Patch Cables are manufactured to meet the needs of today’s electronic musicians. The series utilizes slim plugs that make it possible to use in any modular synthesizer rig without interfering with other cables or controls. Hosa’s Hopscotch Patch Cables are available now with an MSRP of $34.95.